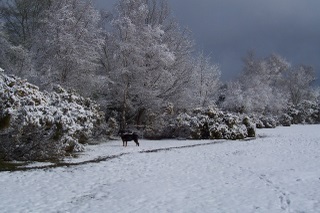 New Forest snow in April? 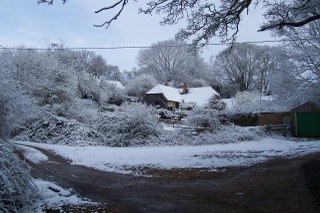 New Forest snow in April meant not spring but winter had returned with a vengeance. All these photos were taken in colour! When I drew the curtains back on April 6th 2008 I couldn't believe my eyes. This was the fantastic scene that greeted us. Not only was there snow but it was perfect! No one had yet stepped out onto the snow on the green in front of our house. There is a special joy in stepping into snow which is untouched by any other feet. 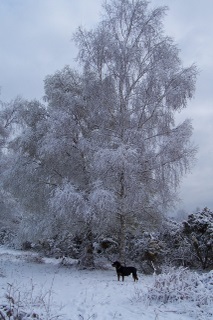 This New Forest snow was perfect, crisp and crunchy and not at all slushy. I was really grateful I didn't have to try to get the car out and stagger off to work. 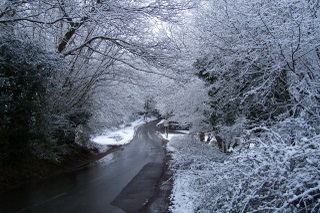 That made this winter wonderland extra special even if it was in spring! The snow was fantastic quality but also quite thick. This is probably my favourite photo of that wonderful day - I may be a bit biased as it has my lovely dog in it! I must admit I was like a child again and when I took some of these photos I was actually muttering away to myself - how amazing nature is to transform an already beautiful landscape so perfectly? Before I go completely barmy remembering this stunning day, there was of course a worrying aspect. To have such a thick covering of snow in April, the night time temperatures must have really dropped. Foals had been popping out all over the Forest and a big drop in temperature, such as this could mean if they got wet and chilled they may not survive. I spoke to my local Agister and all seemed well. 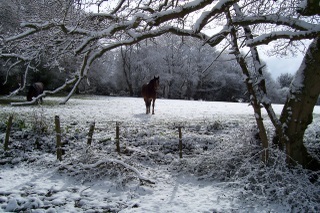 My friend who has lots of her own Commoner ponies out said she hadn't encountered any mishaps due to the snow so it was possible on this fantastic day to experience New Forest snow on a crisp spring day in April and not in winter! If you want to search New Forest Life.com without using the navigation bars on the left, then here's a really useful Google tool. Just put your search details e.g. pigs in the search box and hit Search and you can choose to search my site or go onto the Web and come back to NewForest-Life.com.